What are you planning to do this summer with the kids? Water parks or amusement parks? Day trips to historic monuments? Camping? 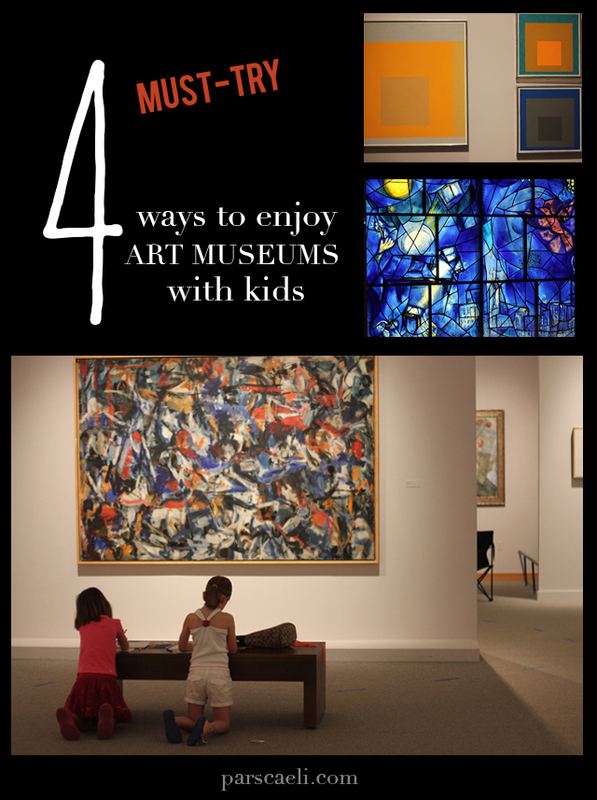 How about hitting the local art museums!! They can be a whole lot of fun, too. Kids and art are a fabulous pair. And art transforms us, while helping us remember who we are. It defines us as human beings and sometimes even elevates our handiwork to show a sliver of heaven and Divine creation. But even with all that beauty and awesomeness in an art museum space, a family excursion to a quiet, clean, monitored space can sometimes be a total disaster or at best a giant headache. Today I'm sharing our ideas on how to make these journeys peaceful, enjoyable, and can I even throw in... inspirational? Well, let's start at peaceful. I know it's an obvious, but it deserves its very own point. Do not take children to a museum and expect them to have energy to walk and interest to look unless they are hydrated, fed, and relatively rested (that goes for the adults, too). Hitting the sculpture garden with a cranky, crying, tired child will leave you beating your head against the wall. Enter the excursion with a sense of energy and enthusiasm and time it well. Early morning and mid afternoon can be a wonderful time to explore art. Side note: make sure you hit the restrooms before hiking up the stairs to the Renaissance wing. 2. DO YOUR RESEARCH AND SHOW YOUR LOVE. If you're going to a museum you've never been, take the time to learn the highlights and find your own must-sees. Your children will feel your enthusiasm and want to discover right along with you if you set the tone in the right way. It will also encourage your children to find their own favorites and show them off to you! Let them know you're interested in the art they love. famous works in the museum. We had each child pick postcards of their two favorite pieces. With art museum map in hand, we made our way around to each of their picks and enjoyed what we saw along the way to these galleries. We then took each child's picture with their favorites, and these works became something personal and a special memory from the visit. 4. IF POSSIBLE, BRING YOUR SUPPLIES. Many of the larger art museums ask that you check your bags. Smaller art museums are more flexible. When we can, we have the kids bring along their sketchbooks and colored pencils (easy to transport, harder to do damage). Whether it's on a bench or right on the floor, sitting and sketching can take the experience to another level for kids. Let them decide the art work that they want to draw and give them as much time as you're able to complete their finished piece. 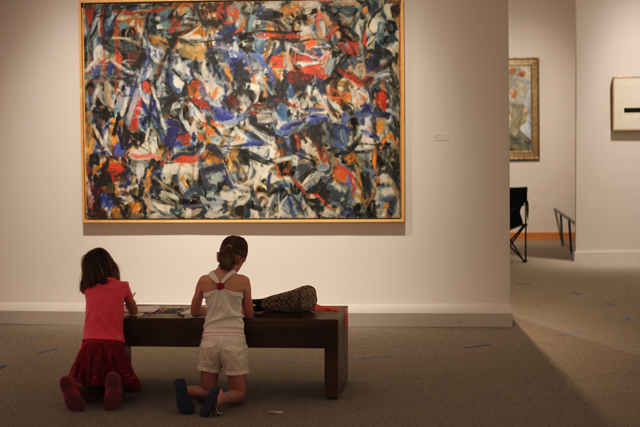 Do you have any great ways to enjoy art museums with children to add to the list? Let's get out there and explore these beatiful places... and bring our kids, too!